Most triathletes who come from running and cycling backgrounds are well acquainted with “sinking legs syndrome,” an imbalance in body position during swimming. 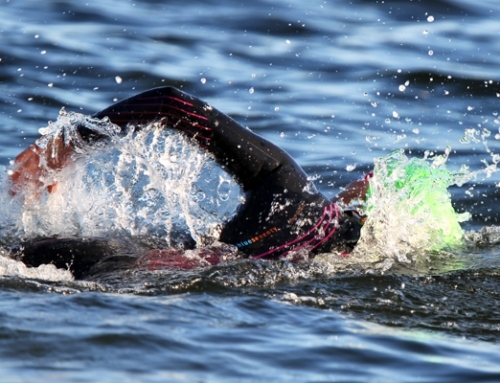 With more muscle mass in the legs, it’s not surprising that it’s a struggle to keep the feet at the surface, especially in an open water swim where lifting the head to sight is required. The instinctive response to get the feet back to the surface is overly vigorous kicking. This, in turn, not only causes rapid fatigue, but also offers little in the way of balance correction and forward propulsion in anything but a sprint. Fortunately, there are other ways of correcting sinking legs and swimming with more efficiency. Body position can be better maintained through consciously controlling buoyancy through a steady breathing rhythm. 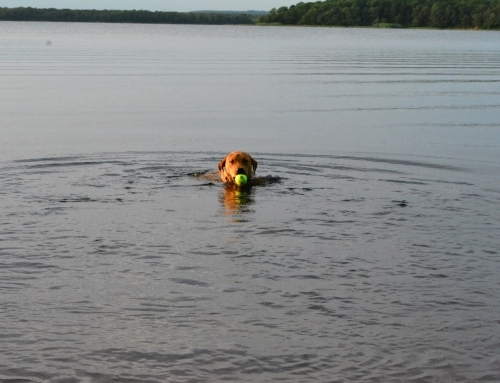 When we’re swimming, our lungs serve a dual purpose: respiration and buoyancy. Some fish have swim bladders that serve to maintain their buoyancy in the water, even while the fish remains still. Unlike a fish’s swim bladder, however, the percentage of air in our lungs must continually change as we breathe. It’s worth noting that the difference in our buoyancy between empty lungs and full lungs is significant; fully exhaling will usually result in sinking to the bottom. 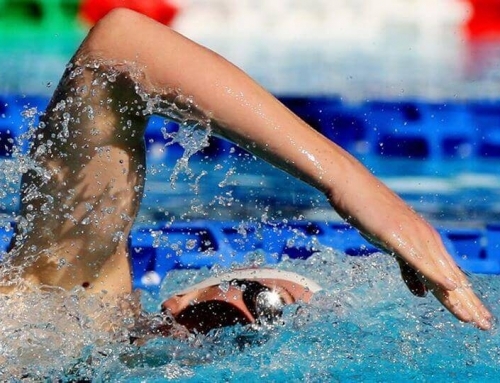 Seasoned swimmers control their buoyancy without realizing it, by rationing out smaller exhalations throughout the stroke cycle, rather than dumping air entirely or all at once, because they become in tune with the sensation of changing buoyancy. Fully exhaling and fully inhaling will not only create drastic changes in buoyancy and resulting instability in body position, but it can also lead to hyperventilation and even loss of consciousness. The key is to achieve as close to a normal resting/breathing rhythm as possible while swimming, in which there is some air in the lungs at all times, with slight variability through breathing cycles. This comfortable and natural breathing rhythm will ensure that there’s always some air in the lungs and prevent loss of buoyancy. To perform this safely in an open water environment, it’s necessary to first attempt to replicate resting breathing rhythm while swimming in a controlled environment, i.e., the pool. Focus is on ability to utilize breathing to maximize both oxygen intake and the body’s buoyancy potential. By focusing on breathing rhythm as it relates to buoyancy, it’s easier to achieve a more balanced body position where the center of buoyancy in the body acts as a counterforce to center of mass. This is especially important in open water swims, where the effects of drag are typically more significant than in pool swims. These factors are also unpredictable and continually changing throughout the swim: swells, chop, and commotion caused by other swimmers present constant challenges to maintaining an optimal body position that is balanced and aligned to enable stroke symmetry and rotation. Learning to maintain balance, then, is fundamental to swimming freestyle with efficiency—as fast as possible using as little energy as possible. 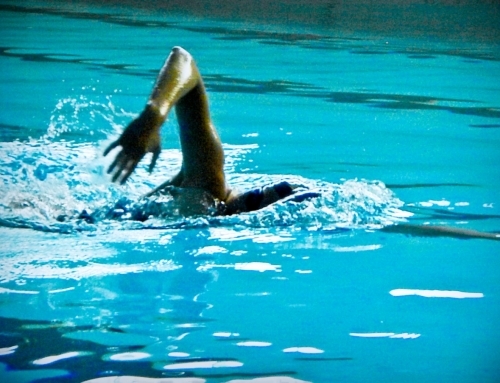 As always, train for new open water technique by starting in the pool. Floating still, experiment with varying the amount of air in the lungs and compare the results on buoyancy. 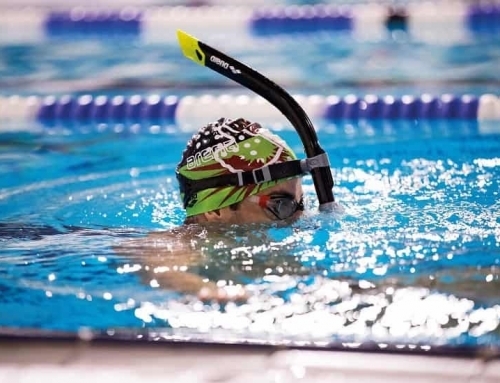 Using a snorkel while swimming will help you concentrate on breathing rhythm and body balance. Try to establish a natural and comfortable breathing rhythm, and practice as long as necessary in the pool before attempting these techniques in open water.